Mrs. Groundhog - my new "tenant"
The other day I joked with my husband that each gardening year brings some kind of "plague" along with it. The first year we moved in it rained so much that all our tomatoes got blight and died. The second year there were so many grubs in the lawn that the Japanese beetles took over the garden. (Less lawn=less grubs now.) Another year spring was so early that a late frost threatened the fruit trees. So far, this year we've experienced a very dry spring and a surge in pest activity, namely voles and groundhogs. 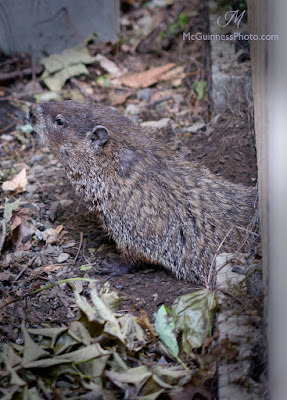 After thinking I was so clever and fencing off the gaps in the back fence to keep groundhogs away, I discovered that I had fenced them into my property because they had already took up residence under the shed. (Gotta love the irony in that one.) I'm learning - the hard way - what plants they like to eat. I've been trying a new product this spring after being referred by a friend earlier this year. It's called Repellex Systemic, and mine is a granulated powder that you sprinkle around the plants. The key is applying it as the plants grow so it is absorbed by the roots and causes the plants to taste like hot pepper. It's suppose to ward off animals such as deer, groundhogs and voles for up to three months. So far, I've been applying it to plants that have shown damage, such as poppies, dahlias, black-eye Susans and coneflowers. The poppies have been able to bounce back, and I'm going to apply more to my coneflowers and black-eye Susans to see if I can save them from being nibbled to death. I wish I could use it on my edible plants, since the groundhog has been trying to eat my zucchini, beans, parsley and celery by sticking her nose through the chicken wire to grab a bite. The voles are still hard at work in my garden after already destroying five (yes, you read that right) rose bushes this past winter by systematically chewing away at the roots until the plants just fell over. There was nothing that could be saved because the plant itself had already died by the time I noticed the damage. Now, when I find vole holes in the garden, I set a mouse trap at the entrance of the hole and place a large pot or bucket on top. I've had luck with catching them this way. Keep deadheading spent blooms and leave the foliage until the leaves wither away. My neighbor grows hostas over her daffodils in her shady driveway, which do a surprisingly good job of hiding the fading leaves. Daylilies serve the same purpose in a sunny location. Did you start all of yours? I didn't. (And when I checked back to my log last year, I found this was the case then, too!) There's still time, especially since the ground is warmer than early spring. I've sowed zinnias as late as July in my garden, but it's nicer to get them in the ground earlier so you can appreciate their blooms longer. Some seeds you may have missed the boat on. For me, any peppers or tomatillos that haven't been started will have to be stored for next year. At the beginning of the month, it's time to fertilize fruit trees, roses and vegetables (organically). Also, as I learned in a lecture from Michael Ruggiero last year, feed containers with a liquid fertilizer at half strength every two weeks. Again, to do this organically, you can use seaweed fertilizer or the "juice" from worm bins. 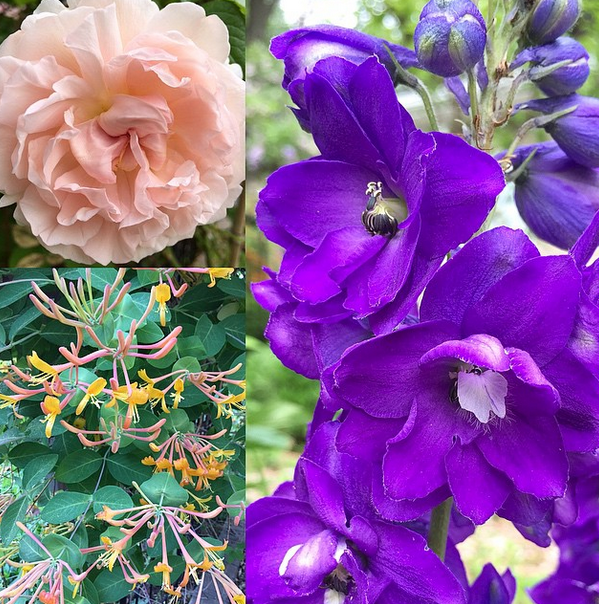 A recent photo I shared from the garden on Instagram. Don't forget to pinch back perennials this month to maximize blossoming potential and to promote bushier growth. Learn how to do it here. Right after the lilacs, rhododendrons and azaleas bloom is the best time to prune so you won't be cutting off next year's flower buds. Natureworks has a good worksheet to explain pruning that can be found here. It looks like my pear trees will be bearing heavily this year, along with a return of plums after a year's absence. The branches are already bending and the fruit is barely there, so this is a good time to get supports in place to balance branches. Plant host plants of dill, fennel or carrots to attract black swallowtail butterflies. Leave milkweed or butterfly weed in the garden to attract monarch butterflies. Succession sowing is the way to keep vegetables going all summer. Beans, carrots, and herbs such as basil and cilantro are plants that can be sown every two weeks to keep a successive harvest. If you haven't done so yet, get your tomatoes and peppers in the ground now. I'm trying my best to not become discouraged by groundhog destruction or falling behind on weeding. (An idea I keep reminding myself that I even wrote about earlier this spring.) What are your gardening chores this month?